Hi there! How as Monday? I think it went pretty well here. It was a humid weird overcast day.. the kind that make you feel a bit sluggish. I was hoping for a little rain, but no luck. I did get some sewing in, I have all my This Diamond Ring quilt blocks sewn in rows and the sashing is sewn, all I need to do is put them together. I had hoped to get them done in time to take them to Diana, my quilter, this morning, but I can drop it off when I pick up the quilt next week. When I finished the rows and sashing and I knew I couldn't get it done I figured I'd just stop there and treat myself to fusing a Tulip Garden Block. 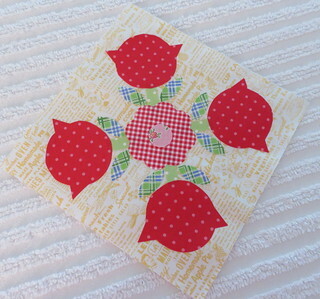 I still love the shape of that tulip and I'm kind of considering getting a custom die from Accuquilt. I think a large and small tulip and some leaves would be fun to have. I can think of a lot of fun projects using them, so it could be worth it. Something to think about. Anyway, I still love the block. I think I'll work on fusing them all then start with the blanket stitching. It will go fast, just three colors of thread, red, green and pink. How do you approach a project like this? I usually do all of one color, then switch to the next. Just take my time, turn on the tv and go! It's so relaxing to me. It's humid here! My poor air conditioners are bravely trying to help. Your block is very cute. Are you doing the blanket stitching by hand or machine? We had 100 degrees yesterday. Then late in the evening we had a lightening storm you wouldn't believe! I have a question about he Accuquilt dies. If you cut out the shape first, how do you get the fusing on them afterwards. Or am I missing something here? I also sew all of one color, then switch to the next. Happy sewing! Love a good tulip. That is cute. You're doing so much and I'm a slug.